Most students are complete in 6 to 7 full days of flying. IMPORTANT: Don't be discouraged by 'training' or 'instruction'. We built our curriculum to be fun, meaningful & real. Sure, we have to jump through some hoops, but we're not here to rack up hours on our way to becoming commercial airline pilots... We believe there's more to being an instructor than watching the hour meter & cashing checks. We train you to fly the way we know you will... You can expect the training you receive, complimented by your common sense, to be very unique & valuable no matter how many hours you have or don't have. Note: Basic outlines of our curriculum for both Ultralight & Sport Pilot are below. Take Intro-Flight & come to your own conclusions. 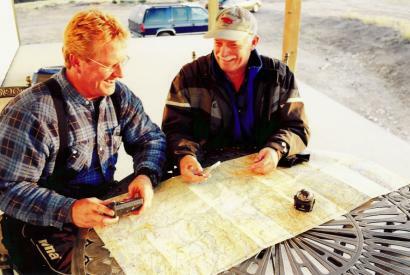 Take Instruction from FAA Certified Instructor. Just take instruction and purchase aircraft later. Purchase aircraft for benefit of training in your own aircraft & discounted instructional rate. Aircraft Setup & Breakdown, Preflight, & Maintenance. Airport Patterns & General Aviation Protocol. Meteorology as it pertains to Recreational Pilots. Aviation Chart & Map Understanding. Airspace. Expect 6-12 total hours of flight instruction as normal. Preflight, Ground Handling, Taxi & Airport Protocol. Entry level flying! Accent, Descent, Turns & Altitude Control. Stalls, slow flight, fast flight, & wing/thrust control. Power on & off landings. Touch & Goes. Cross Country and Navigational Flight. Pass general tests, Solo & receive Pilot Status. Enjoy the lifestyle! Basically, the requirements for a Sport Pilot license are 15 hours of instruction & 5 hours of supervised solo. Take a written test and a final check ride. A detailed description of the requirements can be found in the FAR/AIM. WHAT THE HELL IS "SPORT PILOT?" Recently the Federal Aviation Administration created a new category of pilot called the Sport Pilot. This initiative has dramatically reduced the cost of learning to fly and opened up 100's of new options for aircraft. ALRIGHT, HOW MUCH TIME IS NECESSARY? Sport Pilot certificates require as little as 20 hours of instruction from an FAA certified flight instructor. SO, WHAT CAN I DO WITH A SPORT PILOT CERTIFICATE? The holder of a sport pilot license may fly a light sport aircraft (a 2 place aircraft weighing less than 1320 lbs) unlimited distances within the United States , in good weather, during daylight hours. Along with the new pilot rules, the FAA created a new category of aircraft called the Light Sport Aircraft (LSA). These new airplanes offer brand new aircraft with modern technology, similar capabilities to GA & low operating costs. In addition to new sport pilot candidates, this new Sport Pilot License is available to current and former pilots who have chosen to NOT renew their medical certificates. WELL, HOW MUCH IS THIS GOING TO COST ME? The FAA requires 15 hours of flight training and 5 hours of supervised solo prior to taking a Practical Exam (your final exam). We understand that each individual learns differently and at a different pace, however flying consistently (two or three times per week)(or traveling to to one of our locations for a one week concentrated course) and diligently studying your written material(available on DVD), should keep your costs to a minimum. The cost of a full Sport Pilot course for a student who progresses through the course is approximately $3,300 - $4,000. This includes both the cost of aircraft rental and hiring your instructor. This is tremendous savings when compared to the typical $8,000 - $12,000 required for a private pilot certificate at most flight schools. WHAT ARE THE BASIC "QUAlIFICATIONS"? The fundamental qualifications for becoming a sport pilot are quite simple. Remember, the main idea behind the sport pilot movement is to open up the exciting world of recreational aviation to many more enthusiasts. We love aviation and want to share that joy with you and many others! WHAT DO I NEED TO START MY FLIGHT TRAINING? A desire to learn and a driver’s license. For the most part, you can show up for your first flight lesson with nothing but a sense of adventure. The aircraft and fuel are included in your price of instruction, so all you need are yourself, your learning skills, and your desire for FUN! Just bring your valid state driver's license and get started! Once you've achieved your sport pilot certificate, you'll likely find yourself exploiting every possible opportunity to get out and FLY! You might plan an ambitious coast-to-coast trip, hopping your way across the country through clear-weather routes. Maybe you'll fly away with a friend for a weekend getaway or spend a few hours practicing at the local airport. Or maybe you’ll take in scenic vistas from above. Whatever the plan -- however simple or grandiose -- it will center on enjoying the world from a different perspective, and feeling the exhilaration, freedom, and satisfaction of flying an aircraft yourself. 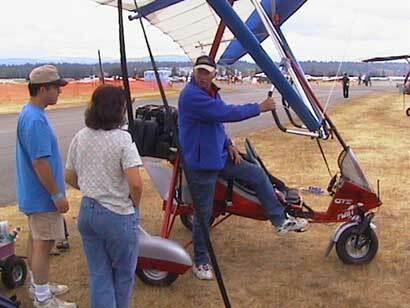 Recreational flight is statistically among the safest outdoor motor sports. Although every activity - even walking outside to collect your morning newspaper - carries a degree of inherent risk, flying for fun falls well within the safety margins that most people expect for recreational activity. And flying as a sport pilot eliminates several risk factors, making it potentially even safer than other general-aviation flying. Because the sport pilot's flight activities by definition entail daylight, favorable weather, good visibility, and light aircraft capable of low-speed flight, the sport pilot can focus on FUN instead of worry. The minimum number of flight training hours for achieving a sport pilot certificate to fly an airplane is 20. Those training hours will include dual instruction (instructor and student), cross-country flying (departing one airport and landing at another), and solo flights. The number of days or weeks required to log those 20 or more hours of instruction is really up to you and your instructor. Will you set aside several days for immersive flight instruction or will you spread out the flight lessons over a period of weeks? WHAT ARE MY PRIVILEGES & LIMITATIONS? When operating as a sport pilot, you as the pilot must operate within the following guidelines of the sport pilot certificate: Privileges: •	Operate as pilot in command of a sport pilot eligible aircraft • Carry a passenger and share expenses (fuel, oil, airport expenses, and aircraft rental); •	Fly during the daytime using visual flight rules (VFR). Three statute miles visibility and visual contact with the ground are required. •	Cross-country flying anywhere in the U.S. •	Fly up to 10,000 feet above mean sea level (MSL). •	Fly solo or with one passenger. •	Share operating expenses with another person. •	Fly in Class E and G airspace (and B, C, and D airspace with appropriate training). •	Allows sport pilots to fly production (standard airworthiness certificate) and experimental amateur-built aircraft that meet the definition of a light-sport aircraft. •	Allows rental of special light-sport aircraft (S-LSA). Limitations: •	Prohibited from Class A airspace. •	Prohibited from flying in Class B, C, or D airspace until you receive training and a logbook endorsement from an instructor. •	No flights outside the U.S. without prior permission from the foreign aviation authority. •	May not tow any object. •	No flights while carrying a passenger or property for compensation, hire, or •	Prohibited from flying in furtherance of a business. Can my Sport Pilot Training count towards more advanced flight training? Yes. Although many Sport Pilots will remain recreational pilots only others may choose to go on to more advanced training such as Private Pilot, Instrument Rated Pilot, Commercial Pilot, Certified Flight Instructor, and ATP. Your Sport Pilot training is an excellent foundation for this advanced training and is often far cheaper than initial training at a more advanced school. This content is courtesty of Sportpilot.com and SportPlanesFlorida.com. This is one of the better interpretations we have seen. More (specific) information can be found in FAR/AIM. We recommend looking at this information.